Thanks to all members who came to the Initiative 300 presentation and for your participation. The result of the vote taken at the meeting was to oppose Initiative 300 by an overwhelming majority. Accordingly, Cherry Creek North Neighborhood Association will deliver confirmation votes to INC and the Cherry Creek Steering Committee that our Registered Neighborhood Organization opposes Initiative 300. Initiative 300 entitled “The Right to Survive,” was placed on the ballot by a group called Denver Homeless Out Loud, and would allow people to rest, sleep and occupy (on an indefinite basis) all outdoor public places within the City and County of Denver including in parks, the public rights of way in front of private businesses and homes; on tree-lawns, sidewalks, and alleys in residential areas and in outdoor spaces in business districts (such as Cherry Creek North) and on the trail systems, such the Cherry Creek Bike Trail and river-ways. • Prohibit city agencies and law enforcement from executing existing laws that protect public safety. • Make it illegal to “harass” anyone exercising these new rights without defining what constitutes “harassment” versus the aid to homeless outreach and safety enforcement. The threat of civil or criminal lawsuits could actually have a chilling effect on help for the homeless. • Increased cost for Public Works, Public Health and Safety, money which would be better spent on affordable housing and other measures to combat homelessness. As of this writing, no public official has endorsed this measure. Other cities with similar bills have had disastrous unintended consequences. Initiative 300 is more far reaching than any others. We acknowledge Denver’s urgent need to better address our current homeless community, but Initiative 300 does nothing to really address long term needs of the homeless which should be the heart of this issue. What Do You Think About Dockless Scooters and Bikes? Let the City Know! For the next few weeks, Denver Public Works will be gathering the public’s feedback to get their thoughts on the first six-months of the pilot through an online survey: http://bit.ly/DenBikeScooter. (This survey can also be found at denvergov.org/docklessmobility.) Comments received will help determine if adjustments should be made to the pilot program and inform the potential development of an ongoing program. The pilot will continue through the summer. 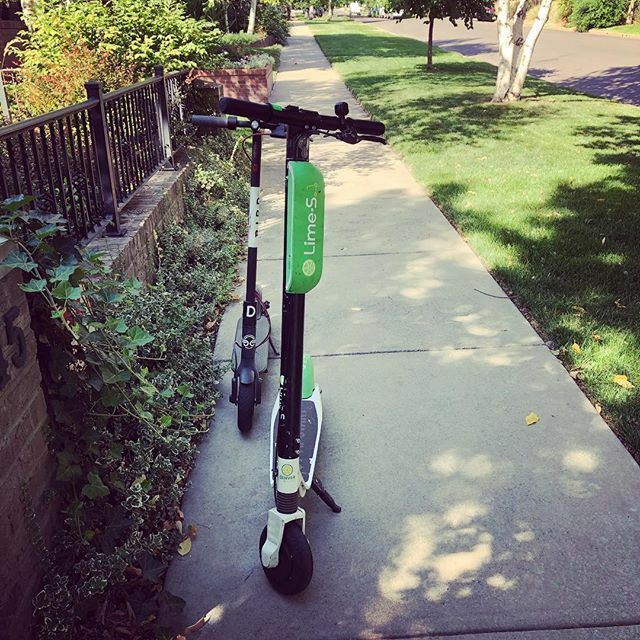 Currently, a maximum of 1,750 electric scooters and 1,000 electric bikes are permitted for use in the city through Denver’s Dockless Mobility Pilot Permit Program. Last week, Denver City Council passed an ordinance which changed the rules for where electric scooters can ride. Under the new law, electric scooters are now allowed to operate in bike lanes or streets with speed limits of 30mph or less. If either of those aren’t an option, electric scooters can operate on the sidewalk, travelling at a speed of 6mph or less. For more information, please visit denvergov.org/docklessmobility. There's something for everyone at Ross-Cherry Creek (305 Milwaukee St.) from baby story time to engaging lectures, crafts and music events. And it's all free! For more information on Denver’s street sweeping program, visit www.denvergov.org/streetsweeping. It will now be easier to pay your CCNNA annual membership dues. Beginning at the General Membership Meeting on May 22, our greeters at the welcome table in the lobby of the Daniels Foundation will be able to process your credit card to pay for your membership. Membership supports our mission and includes invitations to special events and parties. Ready to join now online? It's safe and secure to use a credit card to register via our Membership Page.